This website shares prayer concerns and celebrations for the residents and former residents of Winter Ranch RV Resort. Prayer requests and death notices should be sent to Ron Doerschug, ron5687@embarqmail.com. These may be viewed by selecting the menu item at the top of this page. Prayer Request and Death Notice entries dated prior to January 1, 2014 have been removed. New entries are listed first. PLEASE CONTINUE TO BE the "reporters" for this web site. The only other sources are notices from the WR Park Office. Remember not all of our Winter Ranch friends can be with us at the ranch because of health or other reasons. They especially treasure news of the WR residents. TWO OTHER WEBSITES CONTAINING INFORMATION ABOUT WINTER RANCH AND ITS ACTIVITIES THAT MIGHT INTEREST YOU ARE: www.winterranchrv.com containing general information about the park. 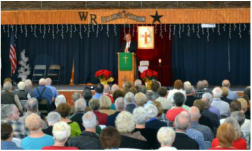 The Winter Ranch Church meets each Sunday, November through March for worship at nine am. Pastor Jim Frisby is the pastor at Winter Ranch. He has served pastorates in Wisconsin and Illinois and was a volunteer chaplain at several prisons. He and his wife Marletta have four children, ten grandchildren, and four great-grandchildren. They presently reside at Bibleville Conference Center in Alamo. Pastor Frisby may be reached at 956-378-5112 if needed. You can find previous entries for any person by keying Ctrl f (hold Ctrl key down while pressing the f key) a window will come up with a line for you to enter what you want to find. Type in the person's last name and press 'next'. Web page will advance to next place on web page that contains that name. Press 'next' again and it will advance to next place on web page that contains that name. You can repeat selecting 'next' until it can find no more entries with that person's name.